America is inflamed! 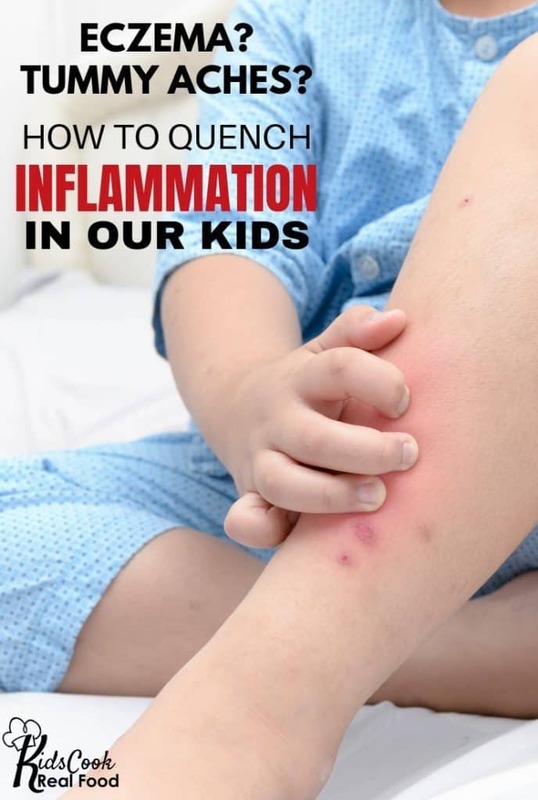 Our kids are suffering in so many ways from inflammation – know any little ones with eczema, constipation, tummy troubles, recurring infections, chronic congestion, mouth breathers, bumps on the backs of their arms? You (and they) need this information about how diet will help bring inflammation down!! It even affects how responsive your body will be to a normal old cold, if you happen to be dragged down this year. 🙁 I’m so honored to host Dr. Sheila Kilbane, an integrative pediatrician, to educate us on this important issue. We talk about what fats to avoid and which to focus on to decrease inflammation in our kids. Dr. Kilbane gives 4 achievable action steps that busy parents can take this week to start improving your child’s health. 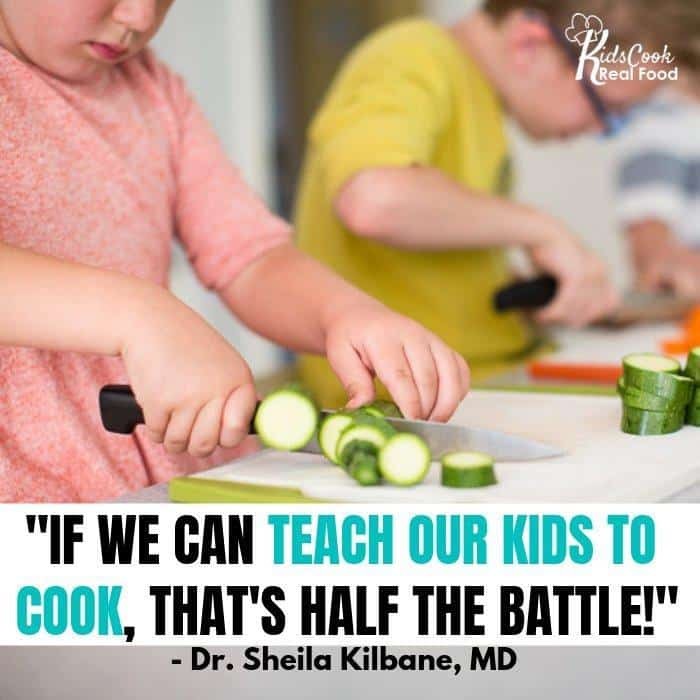 I know you will benefit from today’s interview, and be sure to check out Dr. Kilbane’s course to help YOU be your child’s own detective to improve their health. After this interview, my daughter cut dairy and realized it made her tummy hurt and it’s harder to breathe (for about a week) every time she eats it. 😮 Now to jump into the course and figure out what’s next for us! 0:20: Dr. Kilbane is an integrative MD who is dedicated to helping children thrive in health by getting to the root cause of what ails them. She is local to Charlotte, NC and has developed an online course to help families everywhere to have healthy kids and happy moms. 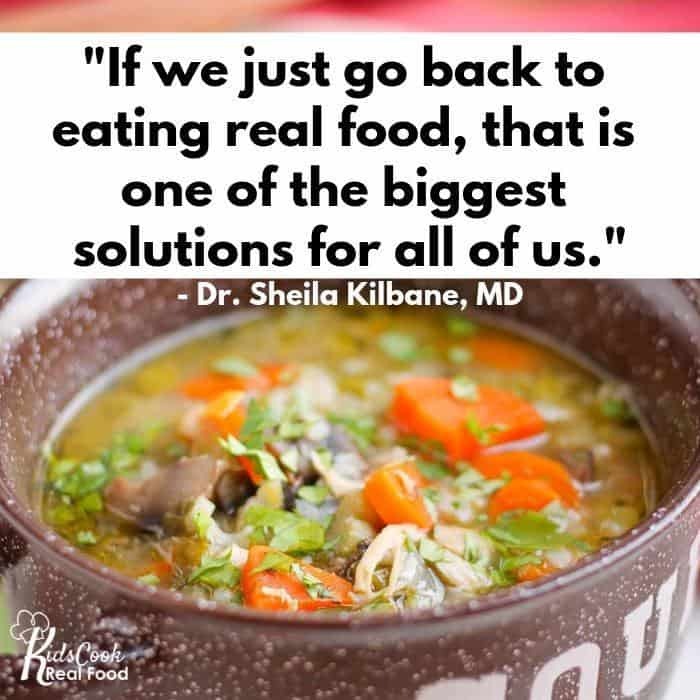 1:33: Shelia offers families 7 steps in her “Healthy Kids, Happy Moms” system: assessment, inflammation and illness, triggers of inflammation, gut health, food and nutrition, supplements and the road map. 3:37: Today we’re focusing in on step 3: triggers of inflammation. 3:57: Inflammation is a huge problem in American today. Dr. Kilbane notes 5 triggers of inflammation: food, environmental allergies, environmental toxins, stress and infection. The inflammation coming from any of these sources can make it difficult for the immune system to do its job. 5:08: Dig into the cellular explanation and how omega-6 and omega-9 fats are hurting our cells! 6:00: The foods we are eating are not nutrient-dense, and they’re causing the problem…150 years ago vegetables oils entered the scene. They are high in omega-6 and this has thrown off our balance of omega-6 and omega-3 in the body. 6:32: When stocking your pantry or looking at nutrient labels you want to use olive, avocado and coconut oil. There are a few others that are ok to use, but you want these three to be the bulk of your oil intake. 7:27: What’s the deal with sunflower and safflower oils? These are common in more “healthy” processed foods. 7:52: If you are decreasing your intake of processed, packaged food, this will automatically decrease your intake of inflammatory oils. If you’re just getting started and want a simple tip to start, this is it! Just pick one meal of the day (preferably breakfast) to not eat any processed foods. 8:30: Some of the symptoms of inflammation in kids: dark circles under their eyes, mouth breathing, heavy/loud breathing, bumps on the back of their arms or cheeks, constipation, abdominal pain, headaches and red cheeks or ears. 9:52: We discussed some fats to avoid. What about foods to increase to reduce inflammation? Most kids, and adults in America are not getting enough omega-3s. Best fat sources include salmon, chia, flax of hemp seeds, even blueberries! You can make small shifts in what you eat and include more nutrient density, especially for babies and little ones. 10:52: There are other foods that contain fats that are also good for us like avocado, coconut oil, olives. The first 3 years of a child’s life are the most important for brain development and healthy fats are essential! 11:17: The low-fat movement is beginning to die out of the mainstream diet advice. This was so harmful for kid’s health over the last couple generations and was compounded by the effects of several other “innovations” in the food industry during the same time span. 12:14: Dr. Kilbane shares 4 do-able steps busy parents can take to start to quench that inflammation in their kids: 1) Shift breakfast. Instead of processed carbs, try to get some omega-3 fats in with chia, flax or hemp seeds in a green smoothie. 2) Add fermented foods or a high quality probiotic. 3) Increase the greens. 4) Add a quality omega-3 supplement if the child is not getting enough fish, chia, flax or hemp seeds. 13:42: There’s a ton of information regarding fish oils on the internet, and it’s overwhelming to find a brand that is sustainable and not contaminated. Dr. Kilbane recommends Carlson brand. Liquid best even 1/4 tsp. — don’t cry now, parents, but she says “no” to gummies! You can read more about how to find a quality fish oil here. 14:43: Dr. Kilbane helps you convince your spouse that adding a fish oil supplement to your routine is worth it for your kids! We are very familiar with anti-inflammatory medications (ibuprofen anyone?) and fish oil helps maintain healthy cells to reduce overall inflammation and reduce your need for anti-inflammatory medications. 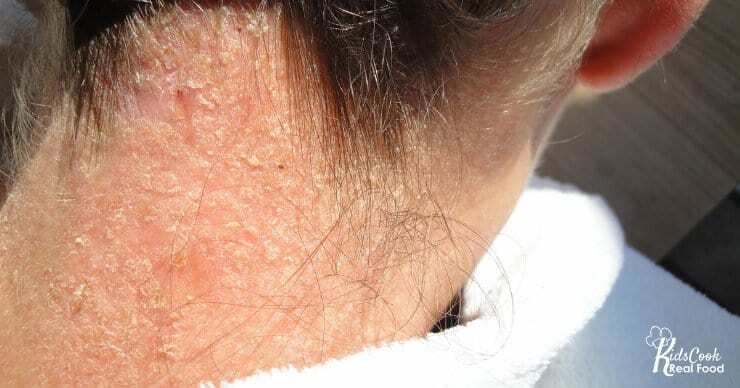 It is an immune system supporter and an anti-inflammatory agent. 16:21: We talk neurotransmitters and how mental function is affected by adequate omega-3 intake. 17:17: School counselors are saying that anxiety is the biggest problem on the rise in kid’s mental health in the past few decades. The calming effects of omega-3s on the brain have huge potential in this arena. 18:19: Unfortunately the links between food, inflammation, mental health and behavior is not mainstream yet. 18:33: Dr. Kilbane shares an inspiring success story of a child who has overcome multiple health challenges by lowering inflammation in her body. Don’t miss hearing this! 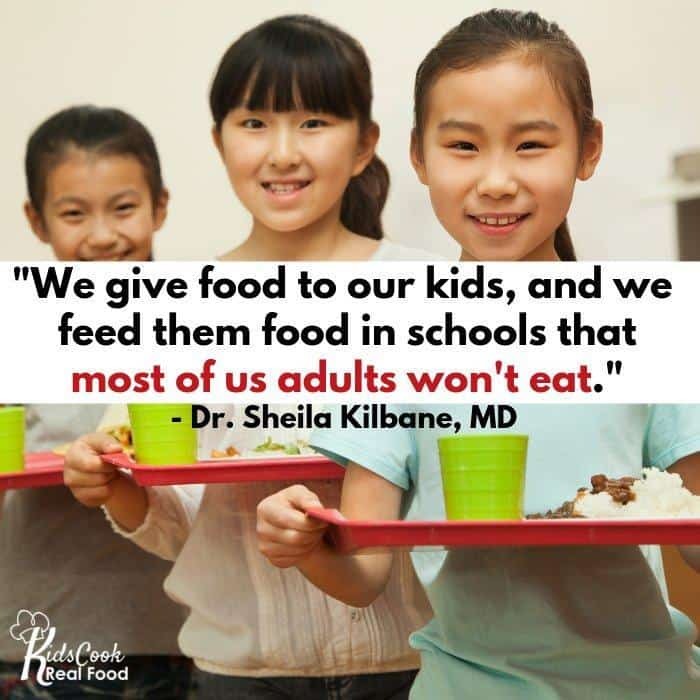 Check out Dr. Kilbane’s course to go through all 7 steps of her Healthy Kids, Happy Moms system and dig deep into your child’s health. Disclosure: As an Amazon affiliate, I earn from qualifying purchases. I’m also an affiliate for Dr. Kilbane’s course, but that doesn’t change your price (and bravo to her for sharing so much actionable info today)!